Visiting hours are 8-5 daily; office hours are 8:30-4 weekdays, 9-2 Saturdays. Concordia Cemetery, founded in 1872, is operated by an association of several Lutheran congregations in Chicago. The Des Plaines River runs along the cemetery's western side, and the Eisenhower Expressway (I-290) marks the southern boundary; the expressway's construction in the early 1950s necessitated the relocation of several thousand graves in the cemetery, as was also true of Forest Home Cemetery, which is directly across the expressway. Section A (alternately designated Section 23) is completely composed of single, unmarked graves which were originally leased for 25-year periods, after which they reverted to cemetery ownership. 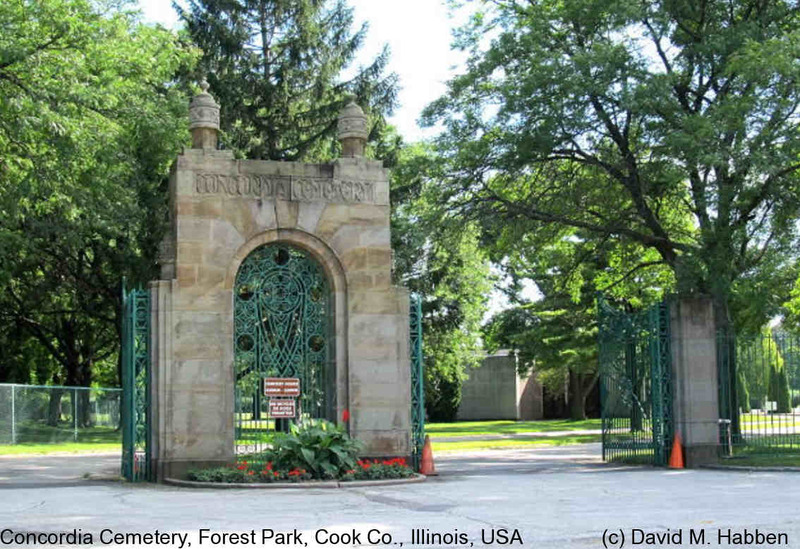 Sections 8-13 are in the cemetery's southern half, south of the former Chicago Great Western Railway right-of-way which runs across the cemetery from east to west; sections 8 and 13 are on the west, along the river, and sections 11 through 13 are along the expressway. The office staff is helpful in providing grave locations, and - when time allows - may assist in locating the gravesite. Genealogy requests, for $3 per name, can also be sent by mail via a form available on the cemetery website; available information includes place of death, date of interment and possibly age, and (after 1912) date of death.